← Bruneau Sand Dune tiger beetles caught in the act! 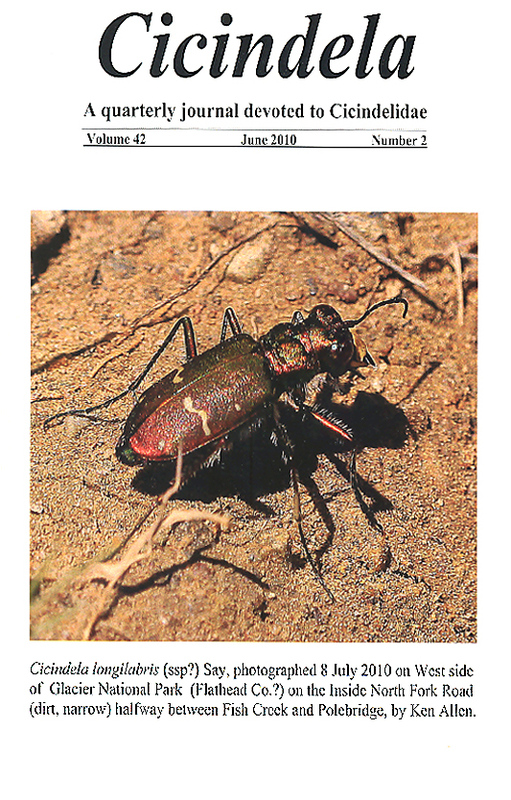 Being a cicindelophile (i.e., a tiger beetle enthusiast), I have on occasion highlighted articles published in the journal Cicindela (“A quarterly journal devoted to Cicindelidae”) (see previous post – also here, here and here). This delightful little journal is the now 42-year old brainchild of Ronald L. Huber, among North America’s foremost experts of the group (and still serving as Managing Editor for the journal). With Robert C. Graves and Richard Freitag also serving as Editors, the journal publishes four issues per year – each containing a variety of articles dealing with the taxonomy, biology, faunistics, and conservation of this captivating group. More recent years have also seen the inclusion of color photographs. For serious students of the group, the journal is an indispensable resource – its issues containing a significant portion of the recent tiger beetle taxonomic literature (indeed, I am fortunate to possess in my own library a complete and nicely bound set of this journal). However, even those with only casual interest in the group can appreciate the journal’s informal, enthusiast-centric tone. A remarkably longstanding labor-of-love, Ron himself lays out and delivers each issue to the printer, then mails copies to the journal’s few hundred subscribers. One thing that the journal has lacked is a web presence. This has becomes all too clear with each article that I’ve featured, each prompting requests for subscription information by readers whose interest in the journal was piqued but were then unable to find such information on the web. All of that is about to change – with Ron’s permission, the journal’s editorial policy and subscription information are being reproduced here to make them more widely available to those who might wish to contribute or subscribe. The cost of the journal is nominal (only $10 in the U.S.), so even the most casually interested person should be able to justify a subscription. Manuscripts dealing with any aspect of the study of Cicindelidae will be considered from any author. All manuscripts should be submitted to the Managing Editor via email or on diskette [see inside back cover for conventions and format]. Papers dealing with areas other than the Nearctic are especially solicited but should be in English. Translations are also very welcome. All manuscripts will be acknowledged upon receipt. Proofs-for-correction will be emailed to authors for quality control. Illustrations, charts, graphs, etc., are encouraged. Authors that have institutional support or other funds available for publication purposes are importuned to arrange for at least partial payment of publication costs. Current page charges are shown inside the back cover. The subscription price for each annual volume of four numbers is currently $10.00 (domestic) and $13.00 outside the U.S. All subscriptions begin with the first issue of the year. Back issues of prior volumes, if still available, are priced according to age. Inquire for prices. All requests for subscriptions and back issue availability should be addressed to the Managing Editor: Ronald L. Huber, 2521 Jones Place West, Bloomington, Minnesota 55431-2837, U.S.A.
My appreciation to Ron for allowing me to post this information, and also to Ken Allen, for permitting me to reproduce the cover of the latest issue of Cicindela, graced with a gorgeous variant of Cicindela longilabris that he photographed in Glacer National Park. This entry was posted in Cicindelidae, Coleoptera and tagged beetles, entomology, insects, literature, nature, science, taxonomy, tiger beetles. Bookmark the permalink. Tiger beetles are fascinating. I’ve only seen the Virginia metallic variety here in Missouri. We have 23 species here in Missouri – you’ll be amazed by the diversity of their colors once you locate a few. It is always a big day when Cicindela comes to the house! Kudos to Ron–42 years of scholarship and dedication! It really is a remarkable feat of dedication. I haven’t gotten mine in a while. Has a recent issue been published? The March 2012 issue is at the printer right now. Excellent! Can’t wait to read it. Thanks. I am working an article of lepidopteloogy in Mexico, Father B. Rotger lived in Mexico for many years and described 2 butterflies in Mexico, there is a biographi in Cincindela v23(4) pp. 55-64. How I may get it? I’ll scan the article next week and email it to you as a PDF.